SIGforum.com Main Page SIG Pistols Picked up another no lock smith 442. Grips? I've got a few with the boot grips, one with vz grips. Show me some pretty grips for this inbound 442 or 642, please. Screw pretty. CT grips or go home on a snubby last ditch “belly Gun”. That being said Eagle Secret Service if you must. I’ve always liked the older factory wood grips used with a Tyler T-Grip grip adapter. I am with slinger. It's an Airweight. It doesn't deserve pretty. Put pretty on your steel frames. CT on your Airweight. However, if you must I do like that T-Grip addition as arfmel mentioned. 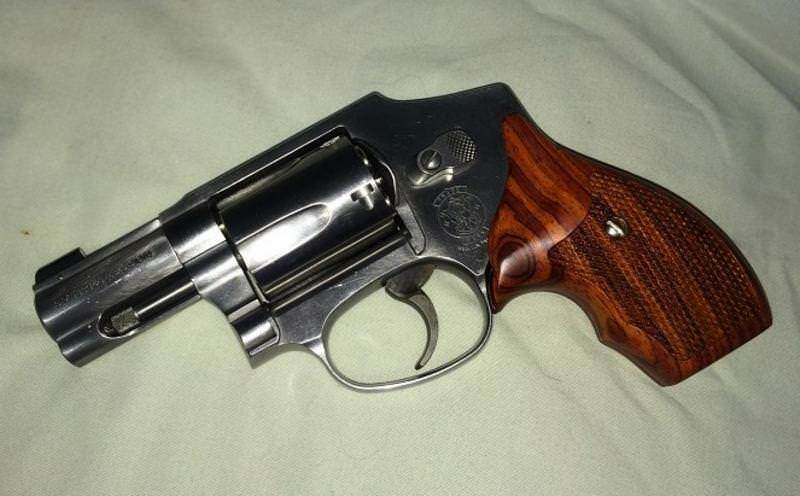 Single piece Hogue are what I've gone to on my 442 and 340. No more grip screws rusting. Mine wears an Altamont basketweave pattern in rosewood. Came from the Smith custom shop 2-3 years ago. One of my 642s wears Spegel boot grips. For me, they're the best grips for snubby J-frames. Compact, but hand-filling, gives good control even with +P ammo. Spegels can be hard to find, and ordering them new can take a year or more to delivery. Eagle Secret Service grips are a good alternative. For pretty grips, check out some of the options from Altamont. My other 642 wears a set of PGS Hideout grips. I have the smooth, non-finger-groove version. A good grip. Hard plastic. Compact. Size is somewhere between a set of magnas and a set of magnas with a Tyler-T grip adapter. Costs about $20 from Brownells. The only downside is that they're not cleared for speedloaders. I filed/sanded mine down to clear speedloaders. I bought a beautiful set of checkered Eagle's secret service Ebony wood grips for my pre lock S&W 638. They looked fantastic, felt great in the hand, but my hand slipped all around when shooting. Sold them, and went back to Uncle Mike's rubber boot grips that came on the gun new. They are not pretty, but my hand sticks to them, allowing me to have full control under fire. Super Walnut Panel type, pretty but not good for gripping. I'll second (or third) the Spegel grips. Have had a couple of his boot grips for different snubbies. Great grips, I sold my last pair off though - went with a laser grip. crap those above are the 2 finger. We settled on the 3 finger. If you want functional, for shooting, the Hogue Bantam rubber grips are rock solid. For looking I like "Exotic Grips by Esmeralda", some really beautiful woods and grains to choose from at a pretty reasonable price. You can view the exact set of grips you will receive on the web site. I've owned several sets and they have fit perfectly but have ended up selling them all and stick with black Hogue G-10 piranha's. I have to slightly disagree with Mustang-PaPa. I have had a set of Esmeralda grips on my daily carry / bug for about 20 years....since before "no lock" was an option. There just wasn't any. They are pretty, and the best feeling grip I've ever had (although they are kinda beat up at this point). But mine are the celtic design and I find them....just....grippy enough to use but smooth enough to not snag? on clothing like rubber grips do. But in fairness, I've never tried the Hogue G-10. Even thought I've been eying the dark earth pair! +1 on Esmerald's. I found this set offered by her a couple of years ago and even though I don't carry my Model 640-1, I still had to get them. Another great option is Herrett's. Quick Reply to: Picked up another no lock smith 442. Grips?